New Zealand was named by the Maori when they arrived “Aotearoa” two translations of this are “Land of the long white cloud” as the mountain ranges were covered in snow. The second is “Land of the long daylight”. In the tropics there is no twilight and the Polynesians would have found this surprising when they arrived. Map: Based on John Arrowsmith’s map from 1881. 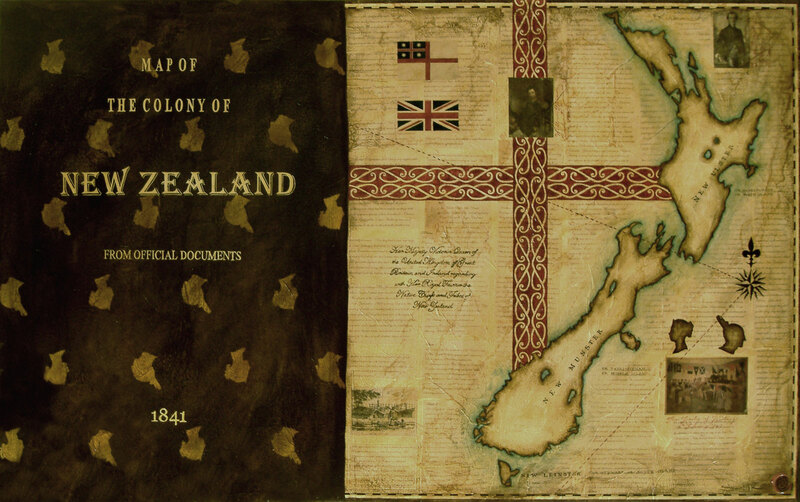 Images of up side down heads on left of painting: Image of Queen Victoria from the Penny Red stamp and a Maori by Sydney Parkinson on Cook’s first voyage to New Zealand. Mesnard, Theodore Romuald Georges: Cases du paha de Kororareka/Mesnard delt; lithe par Blanchard. Paris, Thierry freres. King, Marcus: The signing of the Treaty of Waitangi, February 6th, 1840. © Sandy Rodgers 2015. All rights reserved.